I have been searching for a good, yummy, “I have to make this again!” meatloaf recipe since the very first day I started clean eating. I have cooked every recipe I come across and not once have I had the desire to hold on to the recipe and keep it for “next time”. I actually gave up for a little while and went about my cooking, finding other recipes to replace the things my husband loved to eat with a cleaner, healthier version. Then this morning I decided I wanted meatloaf for dinner. I browsed around online, found some new recipes, read over the ingredients lists to some. By the end of the day I had four different recipes that I thought I’d like to try. By the time I got home, I didn’t want any of them. So I decided to pick one that I liked the “idea” of and tweak it a little. I don’t like too many ingredients. For me, clean eating is simple. Once you get into the double digits of ingredients needed… I start to veer away from a recipe. I took the picture without the glaze on it to show the cooked loaf. I know, it doesn’t look yummy, but it IS! I promise. Preheat oven to 350-degrees. In a small skillet, add olive oil, pepper flakes, red pepper and onion. Cook on medium heat until onions are clear. Set aside to cool. In a bowl, mix egg whites, beef, bread crumbs and cooled pepper/onions together. 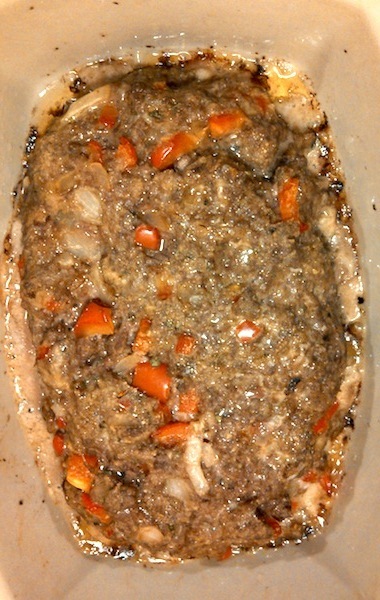 In a small casserole dish or loaf pan, shape meatloaf and place in oven for 25 minutes. 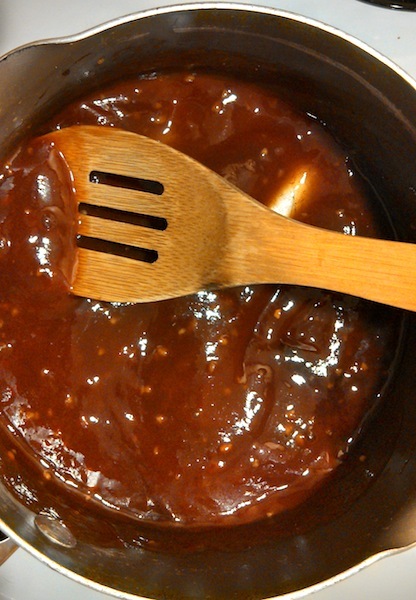 Remove from oven, pour the sauce or “glaze” over the top (cooking directions below). Place back in the oven for 10 minutes. In a small pot, on medium-low heat, combine all ingredients. Stir together well. Cover meatloaf for the last 10 minutes of cook time.